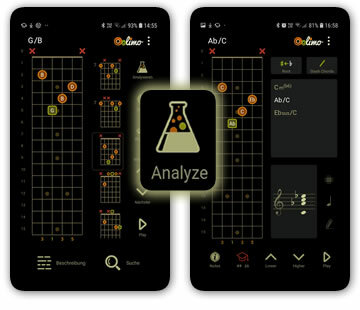 Oolimo Chord Finder and Chord Analyzer as an App! More and more people asked for it. Now I proudly present the Oolimo App with the essential tools! 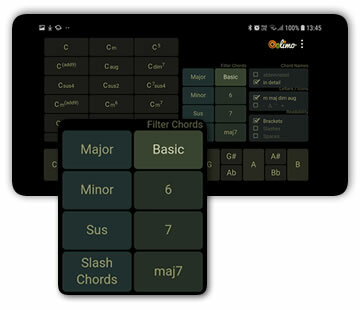 Starting with Oolimo's famous Chord Finder and Chord Analyzer, more and more features will be added with future updates. The app works completely offline, no waiting for sound files to load. To be honest, I'm not at all interested in your personal data. This app is not free, but for now it costs you less than inviting me for a drink, therefore it's free of advertisings and I don't even need to collect any statistical data to convince any flack to deliver well payed banners to jangle your nerves. No annoying "upgrade to pro" messages, you already went for pro :-). The Oolimo app may need access to you divices storage* to be able to store and restore some options you chose or chords you want to remember, not at all to send me nice pictures or tell me anything else about you. *) for now I am just using "web storage" as storing technology. Your phone may not even ask for that one. The only thing I'm interested in is that you can get he most out of this app to improve your musical comprehension and playing. I'm super grateful if you like this app and recommend it to others and if I can at least partly meet the expenses of making a living from the Oolimo project. Thanks and good luck! The Oolimo App is fun to use, wherever you are. The day mode inverts the contrast scheme to increase readability in daylight. Chord diagrams or staves are much sharper in the app, with a nicely cleaned up user interface. 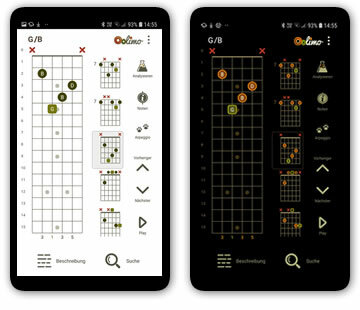 These buttons help you finding your chord much faster. 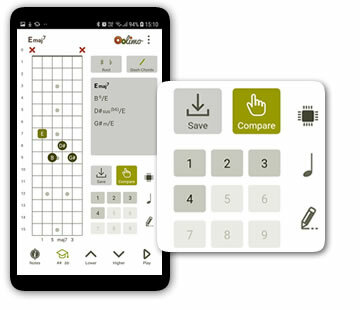 Use the quick storage to save up to 9 chords to compare them or keep them until you know them by heart.